Indonesia's army is to restrict relief workers from reaching remoter parts of the tsunami-hit province of Aceh. The army said aid workers must now register to travel outside the towns of Banda Aceh and Meulaboh, because it could not guarantee safety elsewhere. Correspondents say the army wants to re-establish control over Aceh, where it has been battling separatist rebels. Aceh, near the epicentre of the quake, was worst hit in the natural disaster that has killed about 150,000 people. The United Nations is hosting a meeting of donor countries in Geneva to discuss how best to spend the billions of dollars pledged around the world to help victims of the tsunami. One of the major concerns is to ensure that, in contrast with previous catastrophes, all the money promised is actually paid this time and reaches the people who need it. The head of the army, Endriartono Sutarto, admitted the restrictions could slow down relief efforts. Will Indonesia seize its chance? General Sutarto told the BBC the move was necessary because he had to protect foreign aid workers. He accused the separatist Free Aceh Movement (Gam) of stealing aid, although aid agencies, who have been travelling freely outside the main towns, have not reported any problems. Sofyan Dawood, a Gam spokesman in Aceh, told the BBC that the authorities were trying to paint the rebels as the black sheep, and stressed that Gam were Acehnese - unlike some of the military in Aceh - and were keen to support the aid effort. Correspondents say the Indonesian government and the military may be pursuing different policies on how to handle Aceh following the tsunami. Earlier, Indonesia's foreign minister told the BBC that Jakarta had struck a "gentleman's agreement" with rebels not to disrupt aid efforts. Speaking on a visit to London, Foreign Minister Hassan Wirajuda said he sensed an "optimism that both sides are interested for reconciliation". He said Jakarta had made contact with Gam, in a bid to avoid clashes between Indonesian government troops and rebels during the aid effort. Before 26 December Aceh had been under emergency rule and was closed both to aid agencies and the international media. In 2003, Indonesia's military launched an offensive against the rebels, who are estimated to have lost more than 2,000 men over the past two years. Aid agencies will fear this new directive could increase bureaucracy on the ground where local commanders have immediate control, says the BBC's Christian Fraser in Aceh. Some minor skirmishes have been reported and both sides have accused the other of using the tsunami as a pretext for a renewed offensive, but the claims have not been independently verified. Correspondents do stress the pre-tsunami level of hostility has not resumed. In Sri Lanka, where Tamil Tiger separatists have also fought a long-running battle for independence, hopes that the tsunami might calm tensions have proved unfounded. Sri Lanka's President Chandrika Kumaratunga said on Monday that she had advised UN Secretary General Kofi Annan against visiting rebel-held areas in northern Sri Lanka during a weekend visit to the country. The Tigers have accused the central government in Colombo of withholding aid from Tamil areas of the country and using the disaster as a pretext for sending government troops into Tamil-governed area. 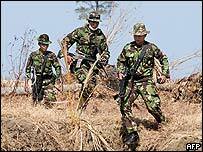 A 20-year war civil war in Sri Lanka killed 64,000 before a ceasefire was brokered in 2002. The agreement was faltering in the weeks before the tsunami struck Sri Lanka.